Fisknat San Juan Net with lightweight rubber net - BOW: 8.75" x 18" HANDLE: 8" OVERALL LENGTH: 26" The Fisknat San Juan Net is a BRAND NEW model, this net is wonderfully constructed for every anglers need. I got my San Juan net a few weeks ago and have only used it a few times. So far, I find it very easy to use and secures the fish without causing harm. Given the quality of construction, I find that the price is reasonable compared to competitors. on 6/29/2012 Best landing net ever, especially for catch and release. 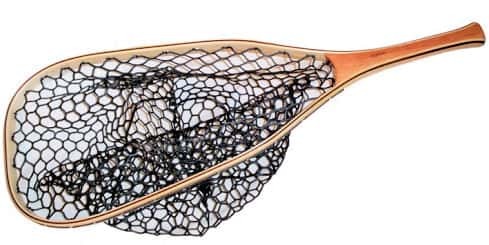 I have used this landing net for a year or two now and it is the best I have ever come across. It totally avoids the hassle of catching your fly in the netting. It is also light, strong and made of durable and beautiful natural materials. Another main advantage is that the damage to the fish is minimal. This net is the next generation of the product and it should supersede all others. The only disadvantage is the price, a new more affordable series should be developed to suit all pockets.